Most burgers are served on a sesame seed bun with the typical toppings – patty, iceberg lettuce, ring of red onion, tomato slice, American cheese, and a little secret sauce that’s basically Thousand Island dressing. There’s nothing wrong with being basic. But, for a mo, let’s forget those quotidian contenders. These over-the-top, no-holds-barred two handers feature primo patties, über-luxe garnishes, and other unexpected elements that will have you swearing off standard-issue quarter pounders for life. Here are 10 totally insane burgers, with sincere apologies to those of you who have brought your lunch to work today. 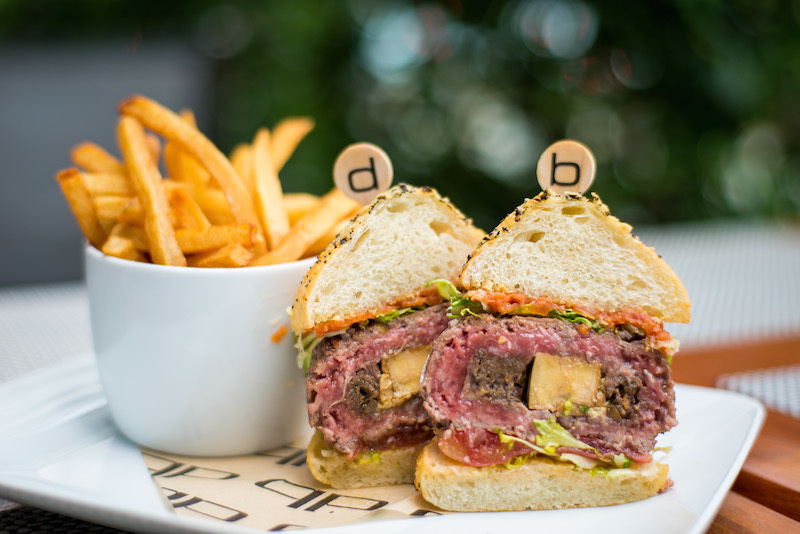 Daniel Boulud may be French, but he has totally mastered the American art of crafting burgers. His most over-the-top rendition stars a ground sirloin patty stuffed with red wine-braised short ribs and foie gras. Slathered with a little fresh horseradish and tomato confit, it arrives on a housemade toasted Parmesan and poppy seed bun. Make a reservation at db Bistro Moderne. How could you not order a burger called the Mac & Cheese Attack? It sounds so amazeballs that we’d be surprised if anyone could resist it. 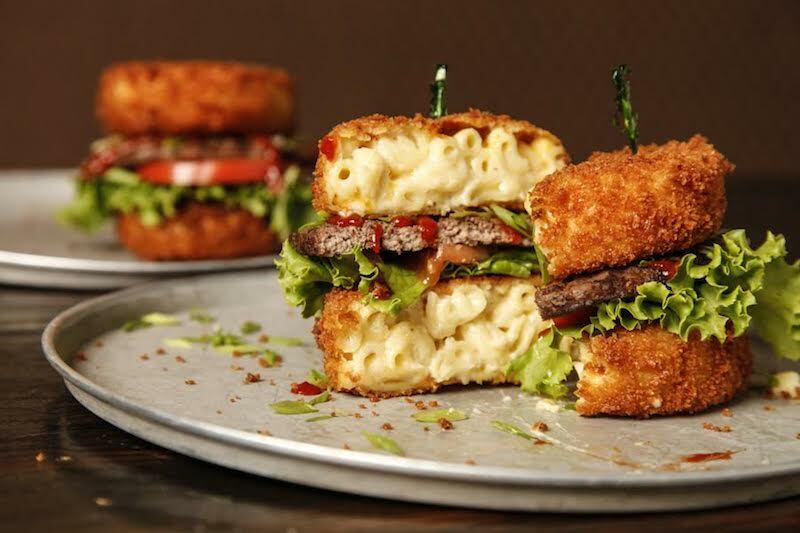 The carb-loaded beast features a quarter pounder nestled between two “buns” of deep fried mac ‘n cheese. It’s garnished with lettuce, tomato, scallions, and sriracha ketchup, which we now know goes really well with mac ‘n cheese. Who knew? Make a reservation at Rockit Burger Bar. This insane, Southern-minded cheeseburger has a couple of things going for it. 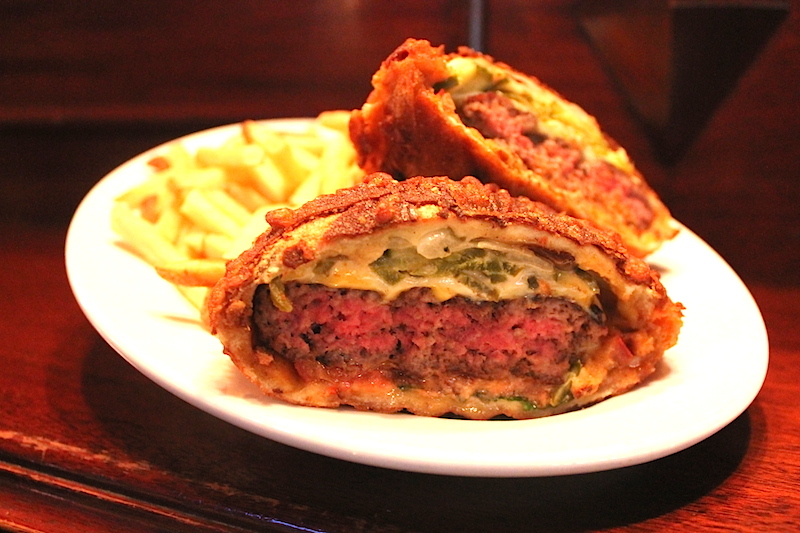 Firstly, it’s stuffed with pimento cheese. Secondly, it’s chicken fried. And, it comes with waffle fries. ‘Nuff said. Make a reservation at Root and Bone. 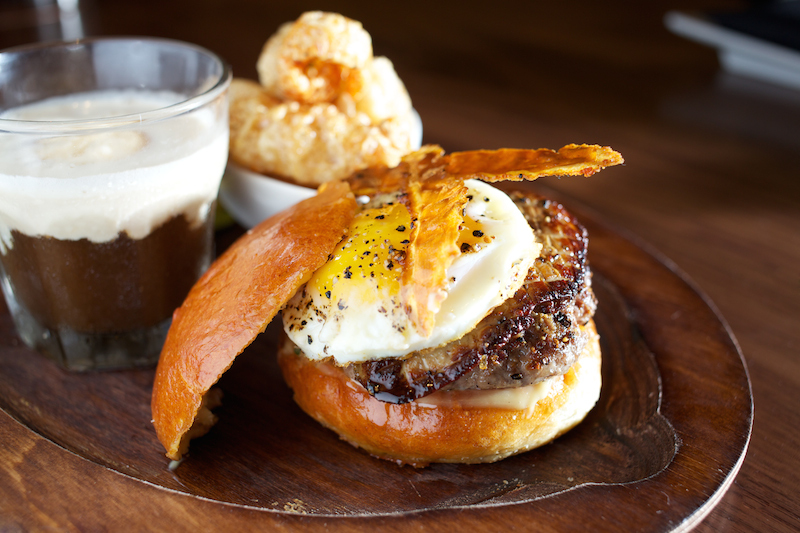 This foie gras-enriched burger comes gussied up with a sunny side up egg and duck bacon. To help wash down all that decadent fat is an equally decadent, equally fatty foie gras milkshake. Which would be a great name for a band. Just sayin’. Make a reservation at SoBou. Don’t tell your cardiologist if you have this for lunch. 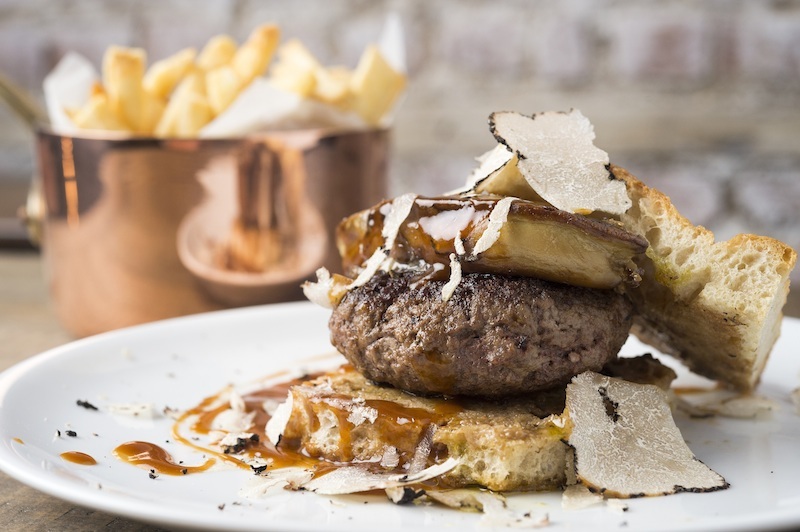 That’s because this burger is capped off with a lobe of foie gras and a snowfall of paper-thin white truffles, not to mention a little gravy. Because why the hell not? You’ve already clearly decided to temporarily ditch your heart healthy diet. Make a reservation at MAMO. Surf and turf together at last in burger form. Known as the Eagle, it’s a half-pound patty shrouded with a veil of melted white cheddar that’s then bedecked with a butter poached lobster tail. A drizzle of truffle buttermilk dressing finishes it off. Don’t forget to post a pic of it to your Instagram account (#envymyburger). Make a reservation at BLT Prime. Never fear, the Murder Burger won’t kill you. Not instantly anyway. An Angus patty is coronated with American and pepper jack cheeses, sautéed onions, jalapenos, pickles and more, then slipped into a brioche bun. As if that wasn’t enough, it’s then dunked in Harp beer batter and deep fried. Deep freaking fried! Make a reservation at The Shannon Rose. Meet the most expensive burger in the world. Price tag: $5,000. Yes, you read that correctly. But this is no ordinary burger. 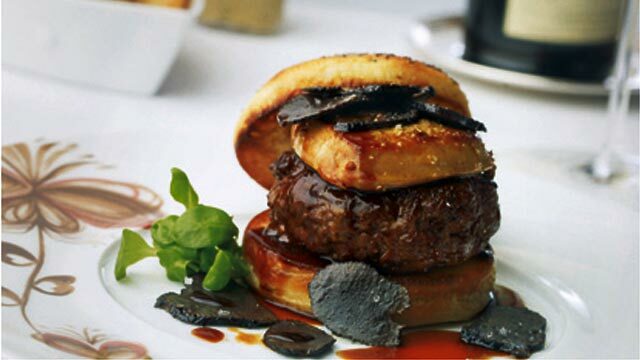 It’s made with Wagyu beef and topped with foie gras and truffles. Plus, it’s paired with a bottle of 1996 Chateau Pétrus. 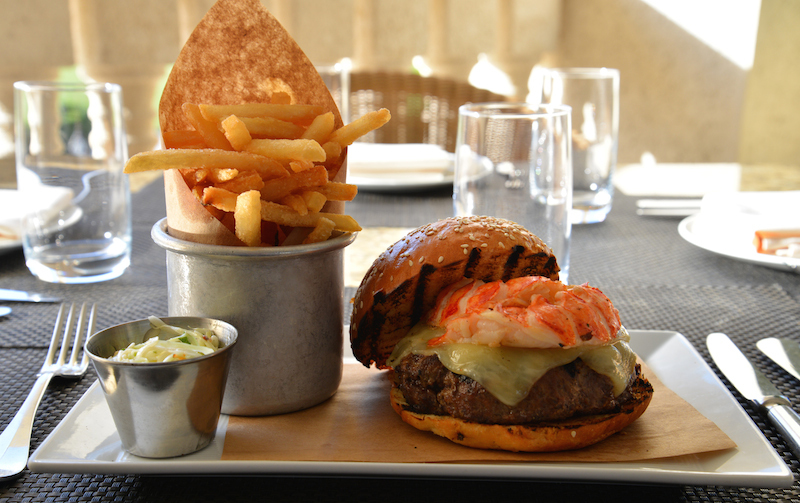 #ballerburger Make a reservation at Fleur. 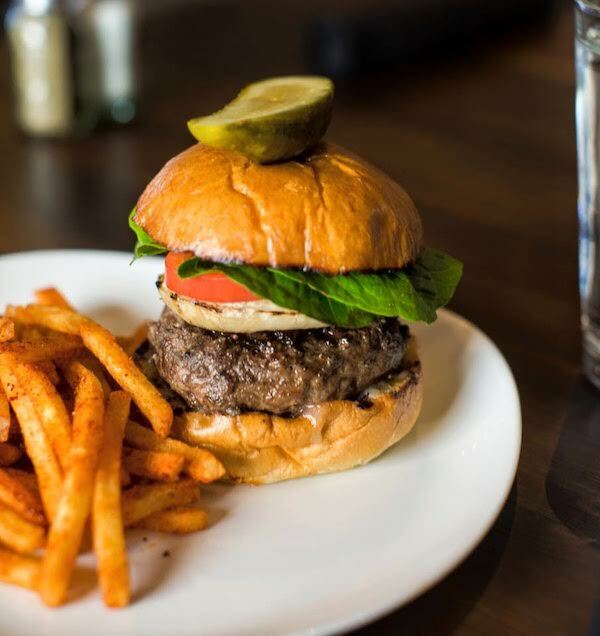 Ever eaten a burger and thought, “This is good, but it would be even better with some marrow?” Don’t worry; we had never thought it either until we tried this swaggery sando topped off with a pat of bone marrow-infused butter. The fatty flavor booster adds an oh-hell-yeah level of umami richness to the experience that makes the burger unforgettable. Make a reservation at Mason Social. The 30 Buck Chuck burger doesn’t mess around. Its 10-ounce patty is forged out of Kobe and prime rib and then topped with Iberico ham, Huntsman cheese (layers of double cream Gloucester and Stilton blue), a sunny side duck egg, frisée, a tomato round, and black truffle butter. Worth every penny. Make a reservation at The Patio on Goldfinch. 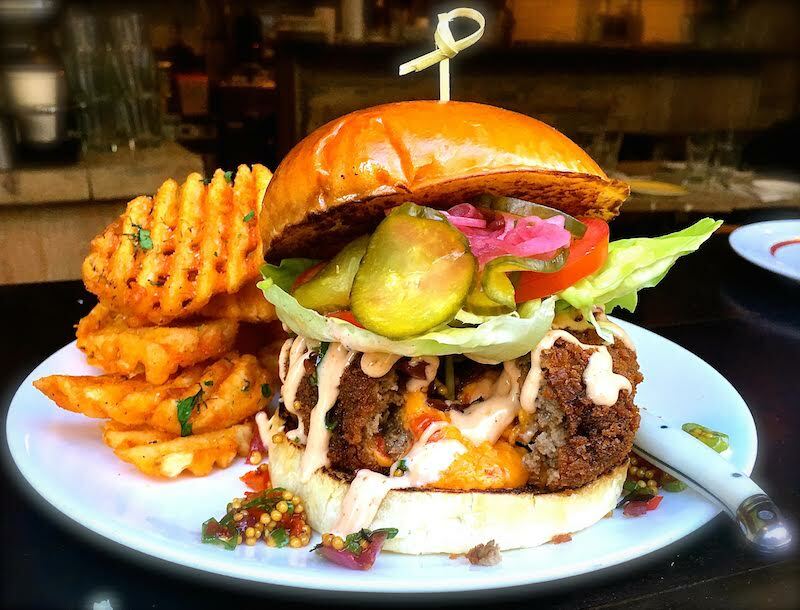 Have you tried any of these over-the-top burgers? Let us know which here or over on Facebook, G+, Instagram, Pinterest, or Twitter. Nevin Martell is a Washington, D.C.-based food and travel writer and the author of several books, including Freak Show Without A Tent: Swimming with Piranhas, Getting Stoned in Fiji and Other Family Vacations. Find him on Twitter @nevinmartell. 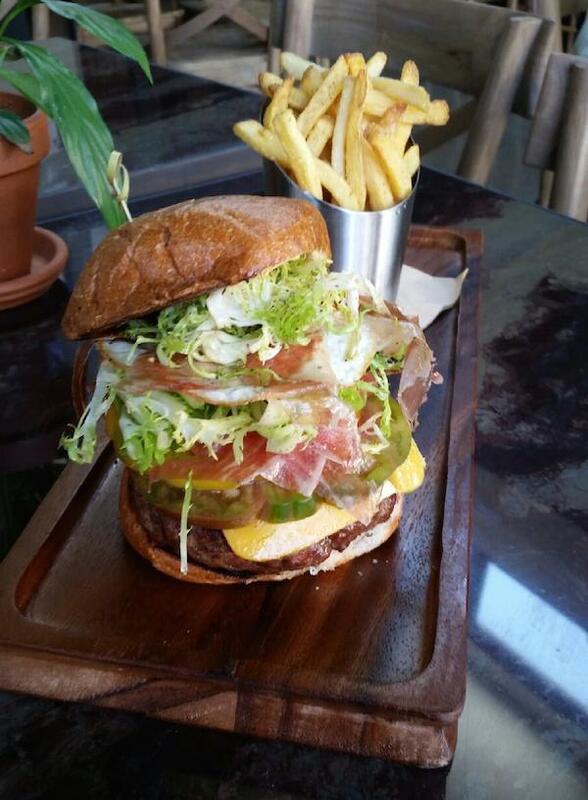 Photo credits: Evan Sung (MAMO); BLT Prime at Trump National Doral.